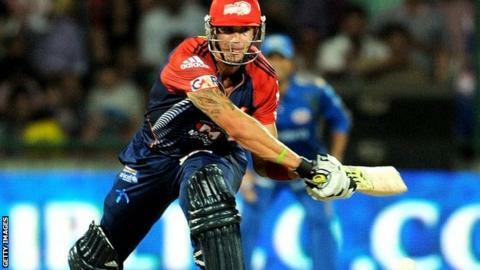 Kevin Pietersen has been bought by the Delhi Daredevils for £880,000 (90m rupees) in the Indian Premier League auction in Bangalore. The 33-year-old Surrey batsman, who had been expected to fetch a higher price, is available for the full tournament after being discarded by England. Pietersen's was the third highest price on the first day of auctions. India's Yuvraj Singh was bought for a larger sum - £1.37m (140m rupees) - by Royal Challengers Bangalore. A total of 514 players will be up for sale for the seventh edition of the IPL. Pietersen played last season for the Delhi side, but they initially chose not to retain him because of his expected international commitments. Pietersen was the only current or former England international to sell on the first day of this two-day auction. England players Ian Bell, Ravi Bopara, Jade Dernbach, Craig Kieswetter, Luke Wright, Dimitri Mascarenhas, Rikki Clarke and Simon Jones failed to sell. They will go under the hammer again tomorrow in Bangalore. Each franchise has a spending cap of £5.87m (600m rupees). This year, players are being bought in Indian rupees instead of US dollars for the first time. Other players bought in the first round of auction on Wednesday included Australia's Mitchell Johnson for £640,000 (65m rupees) by Kings XI Punjab and David Warner for £540,000 (55m rupees) by Sunrisers Hyderabad; South Africa's Jacques Kallis for £540,000 by Kolkata Knight Riders; and India's Virender Sehwag for £310,000 (32m rupees) by Kings XI Punjab. The current record paid for a single player was set in 2011, when India batsman Gautam Gambhir was signed for £1.47m ($2.4m). The IPL starts in April, but while the amount available for player salaries has trebled since the league began in 2008, profits of the teams have not kept pace. The tournament has also been affected by allegations of corruption with a top cricket official recently found guilty of illegally passing on information to bookmakers, the BBC's Sanjoy Majumder in Delhi says. The seventh edition of the 20-over tournament, which features eight teams, mixes floodlit cricket with Bollywood glitz and high-profile corporate sponsorship and runs from 8 April to 30 May. Any England players on central or incremental contracts who are selected for the home limited-overs series against Sri Lanka starting on 20 May, must be back in the UK by 13 May. No such restrictions will apply to Pietersen after he was released from his central contract following England's 5-0 Ashes whitewash in Australia. The England and Wales Cricket Board said on Sunday that it had discarded Pietersen because it wanted an England team based on "trust" with all players "pulling in the same direction". Pietersen, who signed a new contract on Monday to play county cricket for Surrey, has played 21 IPL matches for either the Bangalore Royal Chargers or Delhi Daredevils, but missed last season's competition through injury.